What is included for free? Get your complimentary Summary Report Today! What is included for free? After you register for a free account, you get full access, so you can upload and process your file. After processing, review and share your complimentary TrueNCOA Report and Move Map of your file. In addition, there's no credit card required, your account never expires, and you never lose access to the data - even if you decide to never pay anything. 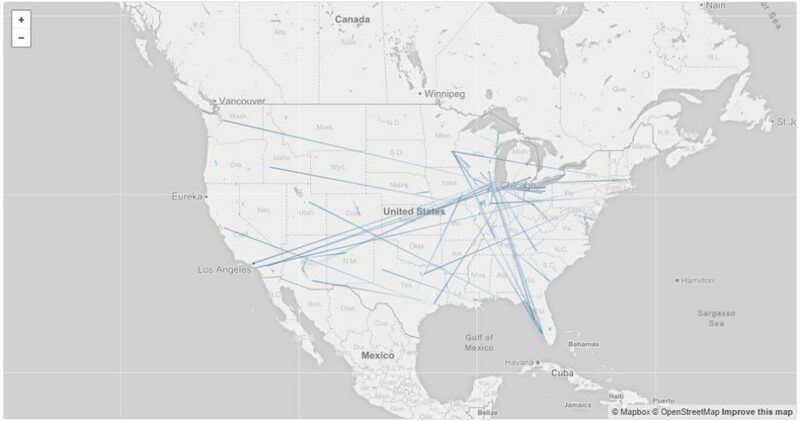 The Move Map draws lines to demonstrate where your contacts are moving from and where they are moving to. In this move map, we see a concentration of people moving from the Midwest to regions in the U.S. South like Florida and Southern California. * Located at the top of the TrueNCOA Report, is our Potential Direct Mail Cost Savings calculator. This calculator estimates the amount of money you can save on postage and penalties by running your file through TrueNCOA before mailing. We calculate your potential savings by using a count of total moves, invalid addresses, expired addresses, and vacant addresses.